The original bull call on the market since 1990. Still number one in sound and clarity! 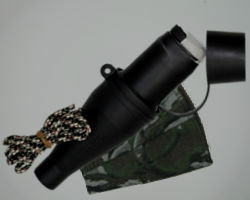 Assembled with black standard mouthpiece, chamber tube, camo cover (assorted colors), lanyard, one medium and one heavy latex and instruction sheet. Length: 23" overall. 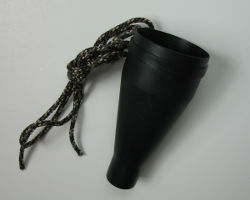 The Dominator Bull Call with external mouthpiece allows the user more control, making it easier to reach the high and low notes in the bugle. Produces the natural chuckle that bull elk create during the rut. 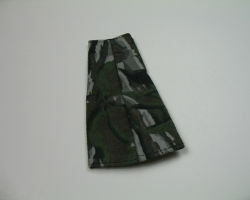 Assembled, with camo cover (assorted colors), and lanyard. Length: 21" overall. 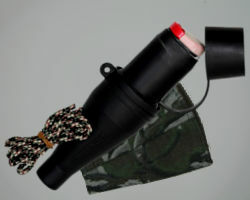 Assembled, with #63 Enticer Cow-Calf (black mouthpiece), #63C Stimulator Cow Call (green mouthpiece), dual holder, and camo covers. Still #1 in sound and clarity, now assembled with the Super Gray (0.004") lite latex. Three pieces of lite Super Latex and two O-rings. New Super Gray (0.004") lite latex, works great on the Enticer Cow and Calf Call (black mouthpiece), and on the Stimulator Heard Talk Cow Call and Chuckler Bull Call mouthpieces (green). Three pieces of medium Super Latex and two O-rings. 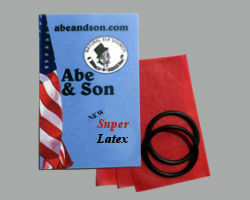 New Super Red medium latex is a long lasting lite latex with medium texture and clarity and works great on Abe's red mouthpiece (Molesstus Estrus Cow Call). 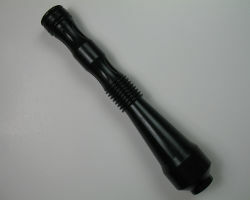 It also works on Flexstone Game Calls (the Call Girl Estrus Call) and Abe's green Stimulator cow call. 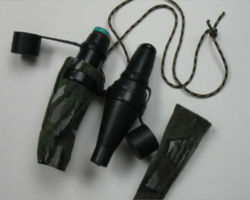 The Dominator Bull Call assembled with Super Red medium latex or Super Gray lite latex will produce an intriguing sound while calling. Lite (0.004") latex is for cow, calf, heard talk, and small bulls sounds. 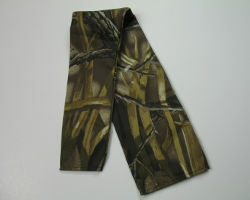 Medium (0.006-0.0065") latex is for all around cow and bull calling. 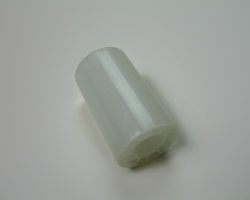 Heavy (0.007") latex is best for the red Call Girl mouthpiece (formerly Molestrus Estrus). Four pieces of lite latex and three O-rings. Four pieces of medium latex and three O-rings. Visit the Support page for tips on latex installation and call assembly. 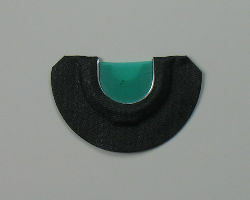 Double cow and calf diaphragm, with cut out. 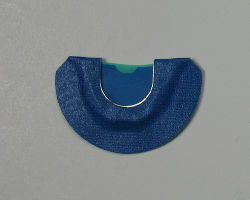 Double medium bull diaphragm, with cut out. 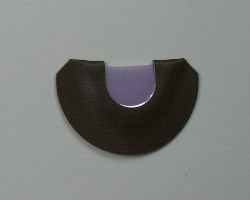 Triple latex diaphragm, with key hole cut out. 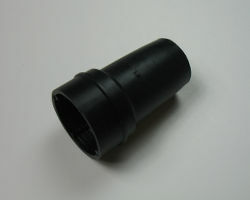 Attaches to the Cow Call Holder or Coupler and Chamber to hold the mouthpiece. 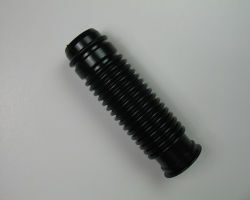 Replacement lower chamber for the bull call. 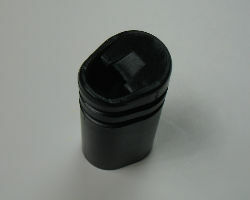 Replacement coupler that inserts between the Chamber and the Mouthpiece Holder. 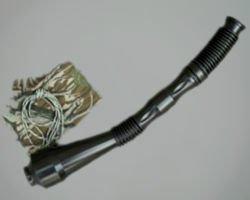 Attaches directly to the Mouthpiece Holder. 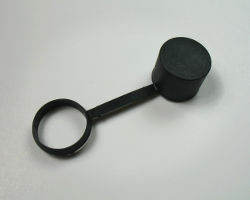 Holds two cow calls, allowing them to be easily held in one hand and switched off without undo movement. 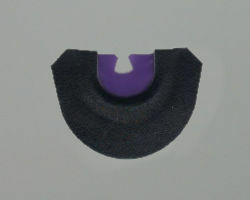 Attaches to the Mouthpiece holder and to protect the mouthpiece and latex. 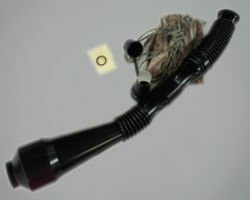 Provides added air flow control. 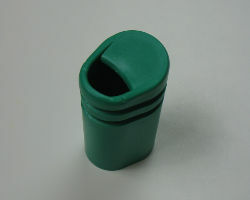 Inserts into the bottom of the mouthpiece. 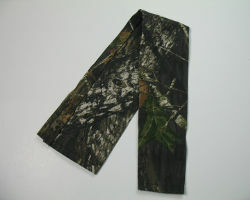 Keep yourself hidden with a camo cover. Also helps mellow the sound for more realistic calling. Only use if directed to by Abe & Son. All items are shipped USPS Priority Mail to the continental US. 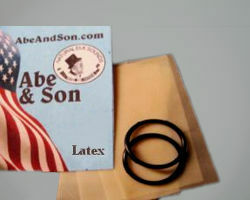 Please contact Abe & Son by phone or email before ordering if you have questions! If you have any technical problems or errors please contact the Webmaster.